We are so thrilled at the fact that Perry loves vegetables. He likes green beans probably just as much as he likes french fries. So he was in his happy place last night at Granna and Grandaddy's for dinner. They had been to the farmers market and that meant all sorts of yummy things like squash and tomatoes and potatos and green beans for dinner. Along with some meatloaf. The squash and tomatoes got fried which made them even more awesome. Andrew wouldn't try them, even fried. Somehow his love for vegetables has not increased with age like mine has. 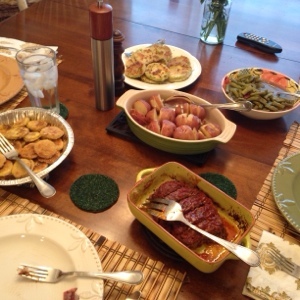 It was such a pretty spread of food! After dinner Ann and I headed to a baby shower for our friend Kelli, who is expecting twins (a girl and a boy) in just a couple months. 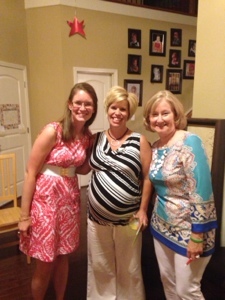 It was a really fun night of fellowship, food and a lot of laughter. We can't wait to meet and love on the babies when they arrive. Congratulations Kelli (and Ben)! 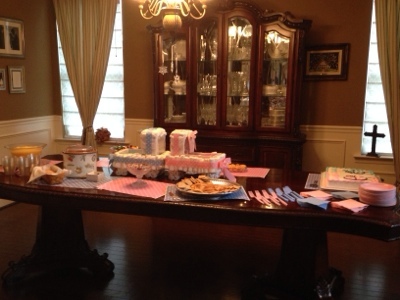 Loved all the pink and blue decorations.